and splashback. 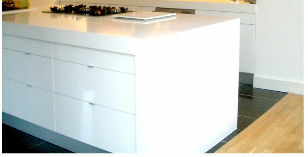 Corian also offers much more flexibility with design due to its composition, so any thickness or shape can be acheived. 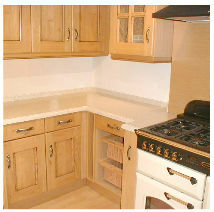 Kitchen Calm are one of the countries main suppliers of Corian worktops to kitchens. 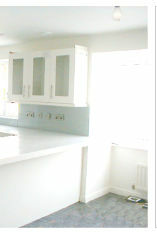 With a nationwide template and installation service you can rest in the knowledge that the Corian kitchen worktop you desire will be handled professionally by ourselves from beginning to end. Have a look at the info below relating to the many corian options. 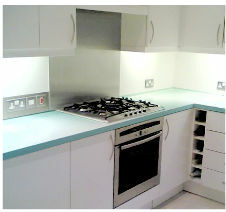 There are a vast number of colours which you can create your corian worktop in. Please click to view those colours. 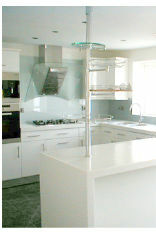 the coved upstand, as seen on the right, is fully integrated into the worktop. You can have it as high as you require so it could be the full wall height creating splashbacks with socket and switch cut outs or just have it standadr upstand height (e.g. 100mm). The benfits of the fully integrated upstand are both aesthetic and hygenic as there is no area for dirt to trap. It is a more expensive option than the standard upstand though. 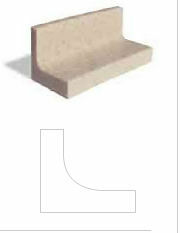 the standard upstand, as seen on the right, is joined at a perpendicular ninety degree angle to the worktop. It doesn't have the curved fully integrated appeal but you can still have it as high as you require so it could be the full wall height creating splashbacks with socket and switch cut outs or just standadr upstand height (e.g. 100mm). The standard upstand is aesthetically the basic option but it is relatively cheaper than the coved.